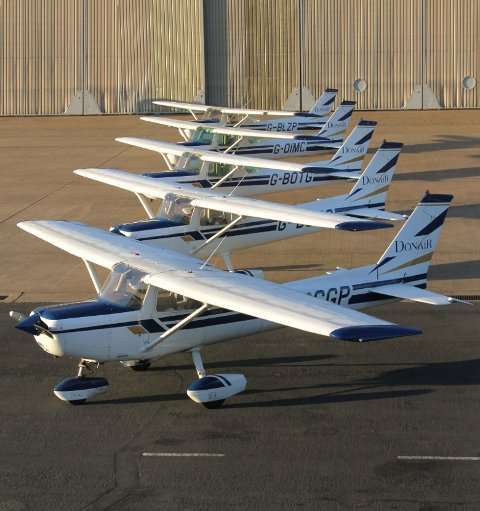 Donair Flying Club's fleet of aircraft are all American made Piper and Cessna light aircraft. These are some of the most popular light aircraft in the world today. Aircraft availability is very good and down time due to maintenance is kept to a minimum since the aircraft are maintained to the highest of standards by our own engineers. These aircraft are the backbone of the training fleet, they are 2 seat training aircraft simple to fly and perfect for training new pilots. Their systems are simple to allow the trainee to spend minimal time understanding them and maximise the time spent understanding the principles of flight. They are some of the safest aircraft in the air, forgiving in the hands of a novice, and can be found at virtually every airfield around the globe. The C152 aircraft are equipped with Lycoming 0-235 (108hp) four-cylinder engines, they have fixed undercarriage and fixed pitch propellers. The PA28-161 Warrior II is a four-seat training / touring aircraft and is the ideal transition to a larger touring aircraft after flight training on the C152. The aircraft is equipped with a four cylinder Lycoming 0-320 (160hp) engine, it is faster and has the added advantage of two seats in the back allowing the pilot to take the family flying. The aircraft is equipped with a more comprehensive communication and navigation radio installation. The PA28-181 Archer II is a four-seat training / touring aircraft with more power than the Warrior, with an increase in speed and performance. The aircraft is equipped with a four cylinder Lycoming 0-360 (180hp) engine, as with the Warrior, it has the added advantage of two seats in the back allowing the pilot to take the family flying. The aircraft is equipped with a more comprehensive communication and navigation radio installation and has a 2-axis autopilot. 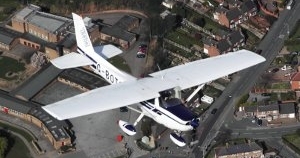 This Aircraft is a four seat training / touring aircraft. Equipped with a large 6 cylinder Continental 0-470 (230hp) engine, it is more powerful than the PA28. The C182 is also equipped with a constant speed propeller allowing more comfort and efficiency over a wider range of flight speeds. 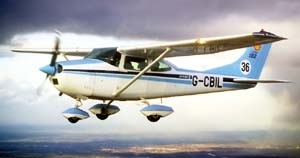 As a result of the constant speed propeller installation, the C182 requires 'complex' differences training and a certain amount of experience with PA28/C172 type aircraft is a desirable prerequisite. This particular aircraft, G-CBIL, won the prestigious Kings Cup Air Race in 2001. 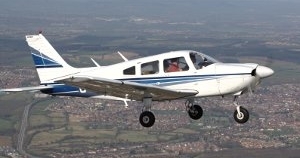 The PA34-200T Seneca II is a six seat twin-engine aircraft for more advanced training (multi engine courses) and for touring. With a higher cruise speed, better performance at altitude, higher passenger capacity and the safety of a second engine, the Seneca is suited to longer flights and over water sectors. It is fitted with two turbo charged six cylinder Continental TSIO-360 (200hp) engines (the right hand engine being counter clockwise rotating to negate critical engine concerns). 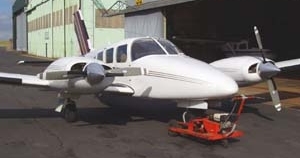 The aircraft is well equipped with variable pitch propellers, retractable undercarriage, club seating, 3 axis autopilot, airframe and propeller de-ice and heated visibility panel, it is also RNAV equipped. 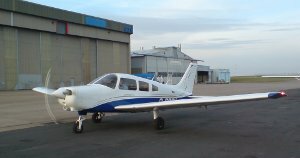 Being a twin-engine aircraft, the Seneca requires the pilot to undergo multi-engine flight training and associated examinations which are retaken annually.